1. Start by going to COMMUNICATION >PowerMail. 2. Select the PowerMail you want in a new folder. 4. In the 'New Folder Name' field, type in what you want the new folder to be called. Click Submit and you have created a new folder and put the current PowerMail into it. 5. Select the new folder to see the PowerMail. 6. To delete a folder you just have to move all the PowerMails in the folder to a different folder. 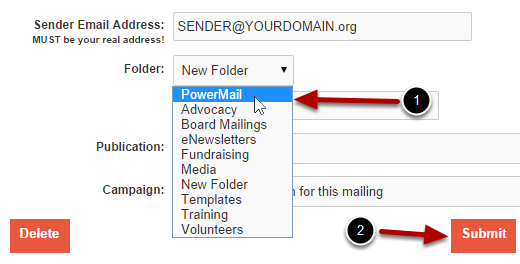 Select the folder you want to move the PowerMail into, then click the Submit button. 7. Once all the PowerMails are out of a folder, that folder will automatically be deleted. How do I access PowerMail?